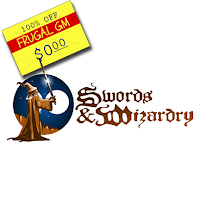 This week's Free GM Resource is a companion to another Free GM Resource from back in 2015...over three years ago. Swords & Wizardry Light is a labor of love from none other that Eric Tenkar (of Tenkar's Tavern fame). Technically this "freebie" is a PWYW and a bit of a twofer. 1st you have the 4 page Fast-Play Rules and then you have these Character Cards. The whole ruleset is already "out there" and featured back in March, 2015, but the cool thing about these two products is that they are really stripped down versions of the game, perfect for introducing to newbs or running a real quick one-off.